Hey there! 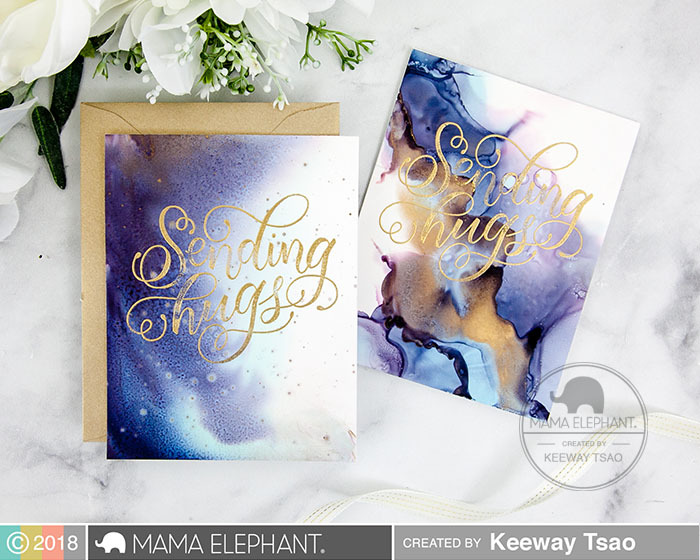 It's Keeway on the blog today and I'm excited to share with you a few cards I created with the new Sending Hugs stamp set using alcohol inks and heat embossing techniques. I have really admired alcohol ink art, and even recently took a course with one of my personal admirations, Jessica Young. However, as much as I admired looking at these paintings, it never quite fit my own cardmaking style because I have always strived for more clean and smooth looks. But I'm stubborn, and I figure it was time to do some experimenting and see what I can do! I blew through a full pack of yupo paper rather quickly, and of the 10 sheets, only 3 of them made it onto my cards today (the rest went straight into the trash). The first one here achieved the softer look that I really wanted, and here I only used Eggplant alcohol ink, gold mixative, and lots of ink blending solution. I simply tilted the paper around to help move the inks, and used a paint brush with adding in the gold mixatives. The goal was to avoid harsh lines, so I did not blow on it. 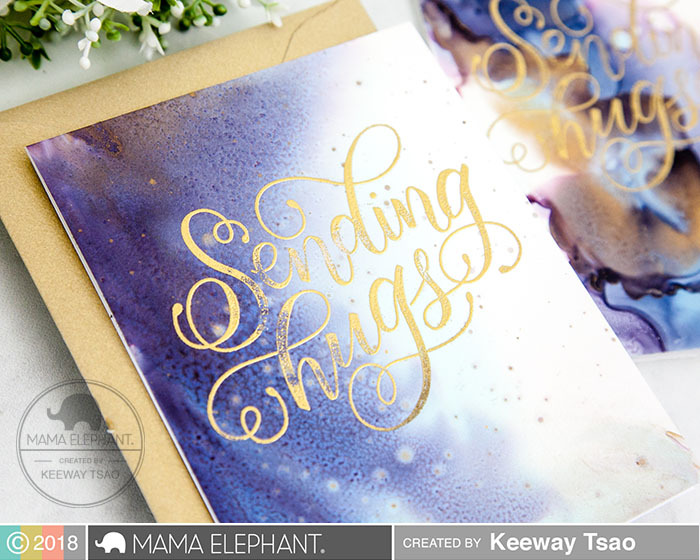 When it was somewhat dry, I even gave it a little gold splatter at the end like how I usually do my ink blended cards! If you've worked with alcohol ink before, you may also notice that the inks dry with a little stickiness and sometimes you might accidentally ruin it by reactivating the inks. So, to prevent that I sprayed it with Kamar Varnish to seal it and set it aside to dry, before coming back to heat emboss the sentiment. 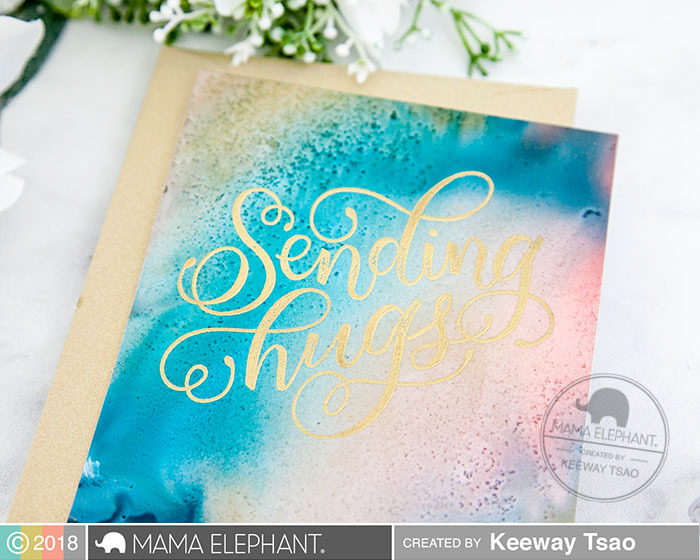 The Sending Hugs was stamped in Versamark ink and heat embossed in gold. It's really crucial here to make sure your heat gun is hot, so that you can melt the embossing powder as fast as you can, because the yupo paper will warp if you're not quick! Mine did warp, but it was minimal enough that after I mounted onto a card base, and laid it under some heavy flat books, it worked out. 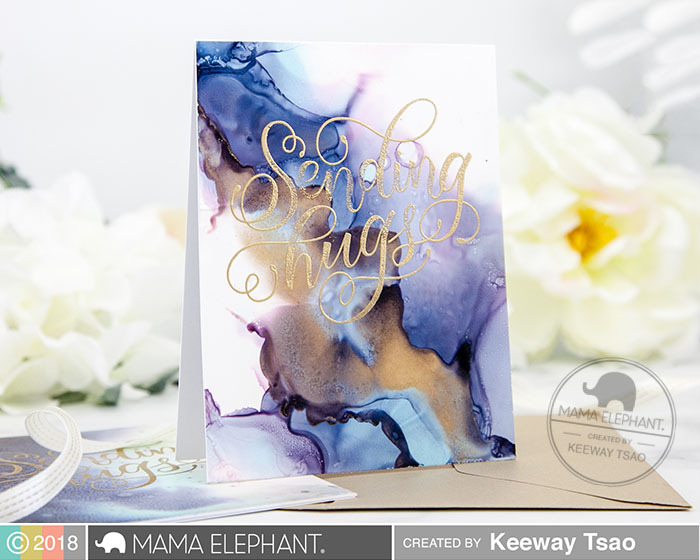 This next one used the same alcohol ink colors, but as you can tell it is a completely different look! There was a little more gold mixatives used here, and some stronger textured lines. That happens when some parts are starting to dry while others are still bleeding out. Although it was the texture I was trying to avoid, this specific one came out rather cool, so I kept it and heat embossed the sentiment right on top of it. The background however is definitely busier than the first, so I think I could have opted to use a darker gold like antique gold to bring out the words a little better. But nevertheless, it was still a very artsy and dramatic look! I tried other colors too. Here I used a turoquise alcohol ink, gold mixatives, and my R20 and R21 copic marker refills. Funny enough, I believe the grainy textures came out because I didn't shake my gold mixative bottle well enough. But I saw it as a happy accident as it adds a lot of definition to the background and I rather liked it! 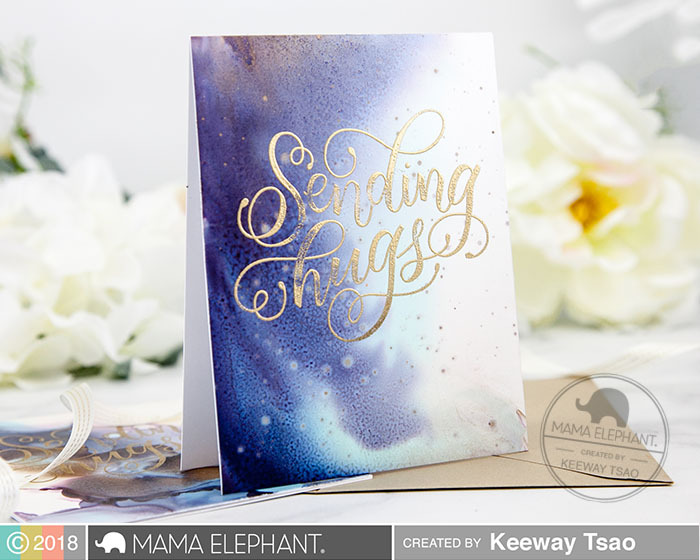 These bold, beautiful handlettered sentiments are perfect candidates to use on unique backgrounds, and I can definitely see any of the large sentiment sets illustrated Paola Jane Esteron make easy, amazing cards! I love them. They are all so pretty and unique. Woww!! I love each of these cards!! Gorgeous effects! These are all gorgeous Keeway. I haven't used alcohol inks yet but they do make beautiful and dramatic backgrounds. Very well done. I think they are so gorgeous! 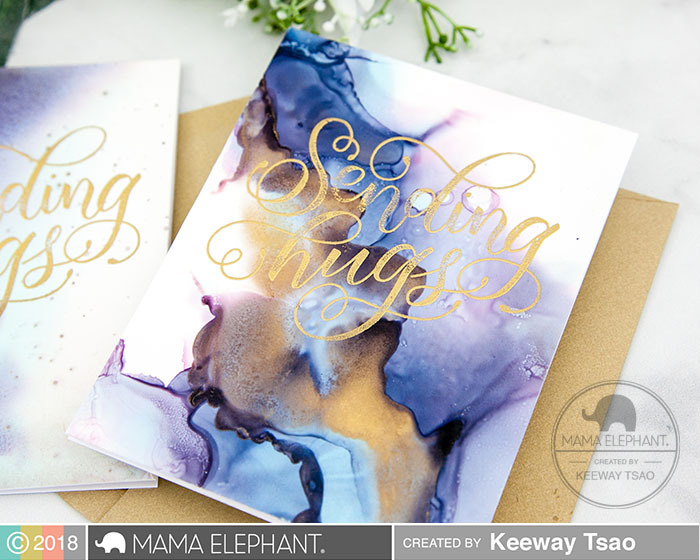 By far the loveliest examples of alcohol ink backgrounds I have seen. So pretty. I would love to have seen what you threw out!